Why I was Migrating & What I Wanted? Before you buy any hosting plan from eHost.com, here is what you need to know. I share my personal experience with you in this review. After two months of hosting my 2 websites with Wealthy Affiliate, I realized I needed to move them to a different host. After a lengthy research, I ended up choosing eHost. Before I decided to buy a hosting account from eHost, I read several eHost reviews from different websites/people. However, after signing up, I felt there are certain important points they didn’t discuss. Its therefore, for this reason I decided to write one, addressing those issues that I feel are important for anyone buying a hosting plan from eHost should know. Well, if you already have your website hosted somewhere else, and you are looking to find a better host for whatever reasons, then you are not so different from me. I’d to move my websites due to some reasons, and here is what I was looking for in a web host. They run CentOS 6.4 Enterprise Linux x86. The connection speed on their servers is 100 mbps (megabits per second). They also backup your website content weekly. So, here is some bit of confusion. eHost offers both cPanel hosting and Website Builder, however, you have to choose one between these two. They don’t come as a single bundle, they are billed separately. When you choose cPanel, then you don’t have their Website Builder,the same applies if you choose Website Builder, you won’t use cPanel unless you make you pay another fee to have it included in your account. If you choose cPanel hosting and in future you realize you need to use their website builder, you will have to make another payment for it. You can have both on your same hosting account, however, you pay for them differently. In fact, I have to admit that I got confused at this point when I was buying my hosting with eHost. First, I was excited thinking that once you buy a hosting plan with them, you get both cPanel and Website Builder included. I just went about clicking, and I ended up with a Website Builder. After contacting support team, this is when I realized it’s not what I’d thought. I had to cancel a Website Builder plan invoice, and re-apply for cPanel hosting. The invoice for Website Builder was disregarded and a refund was made, of course I had to make a whole new payment for cPanel hosting plan. If you are looking to set up a quick website with a WYSWYG builder, then a Website Builder plan is a right choice for you. With 1000’s of beautiful themes to choose from, you will have a website up and running in just minutes. To have full control of your websites, install CMS’s like WordPress, Joomla, etcetera, then a cPanel is what you have to go with. 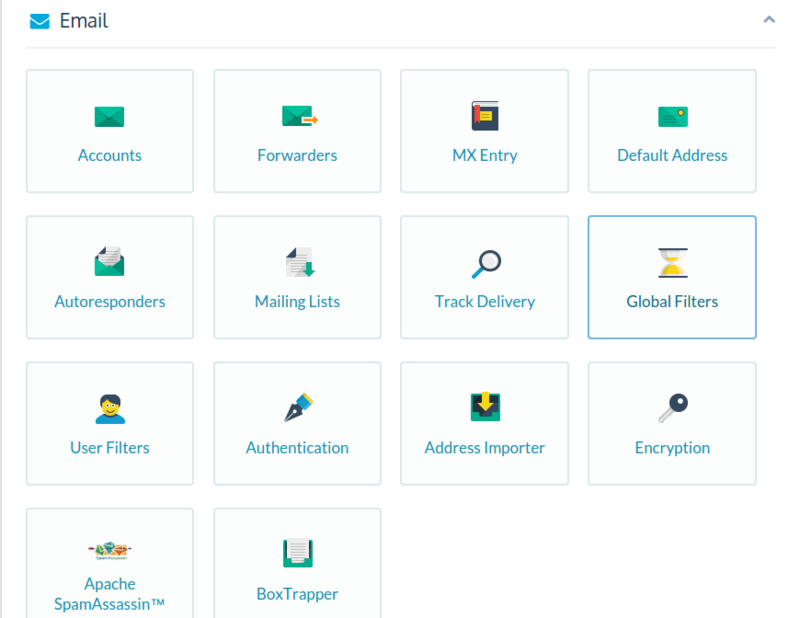 eHost Cpanel is easy to understand, navigate and use. Adding additional features like domains, domain privacy, Search Engine Submision, Site Lock can be done under Add Ons Section. All features under Add Ons are not free, you pay for the services like Site Lock, domain privacy, etcetera. 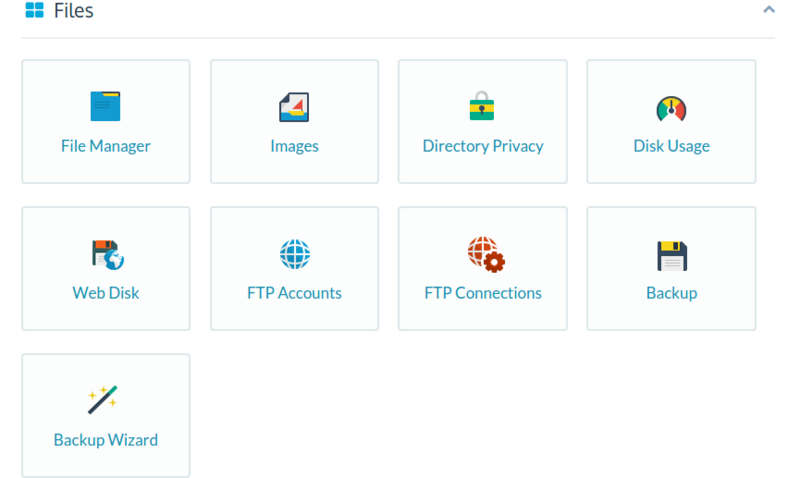 Under Files section, you are able to manage your files, images, check disk usage, create and manage FTP accounts, Backup are some of the features you find here as you can see in the screeenshot above. If you are a big fun of CMS like WordPress, Joomla, Drupal, and b2evolution then a quick installer is there for you. Just with a click of button, you have your CMS installed. Yes, you get a free domain for life, not your life, but the life of your hosting plan. As long as you are still hosting your websites with eHost, you will still be owning a free domain without extra payments. However, if you want to protect your domain, you have to purchase this as an ad-on. Unlike others, eHost doesn’t give you a free domain just for the first year but, for the entire time period you are hosting with them. If you wish to cancel your hosting account and still keep your domain alive with them, you then have to pay for this domain name, which you can then be able to point to another DNS. There are no set limits on the storage space or bandwidth that we provide in our shared hosting plans. We want you to have the resources you need to build a great online presence, and 99.95% of all customers will have more than enough storage space and bandwidth to meet their needs. eHot doesn’t explicitly allot to you storage and bandwidth space, however, they still have a ‘normal‘ limit. It is not small though, unless you are an abnormal user, who does file sharing, you may not really have to worry about exceeding their ‘normal’ limit especially for personal and small business websites. In case you exceed the ‘normal’ usage, you are notified by email and asked to reduce usage which you have to act within 48 hours else, your account is taken offline. eHost gives free free ad credits for you advertise your products/services on Google or Yahoo. However, before you receive and get to use these free credit, on Google you’ll need to spend $25 first before the $100 in additional advertising bonus comes in. If you’re not satisfied with eHost, we’ll give you your money back. No questions asked. During the first 45 days, we’ll refund your hosting fees in full. I have personally asked for a refund when I mistakenly (chose and tested) a Website Builder. There is no pulling of ropes, you get your refund back if you ask for it, without any friction. eHost has an accommodative billing cycle, ranging from $13.98 month-to-month hosting to a $198.00 3-years billing cycle. You save upto 50% on your initial purchase, after which you will then be billed on a regular price on the next account billing. It is a supper saver especially if you are purchasing for a year or two. If you have a small budget and can’t afford a yearly plan, eHost allows a month-to-month subscription. You can upgrade to yearly or downgrade to monthly at any time. Their month-to-month payment provision, is one of the reasons why I chose to host with them. Sometimes you don’t have enough money to pay for a whole year but, can spend a small budget out of your monthly budget for hosting, then eHost understands you. They can host your website on a monthly basis. The support via Chat is remarkable. Its one that I use more often compared to the rest. You can also submit a ticket which can take about 48 hours to receive an update. This somewhat annoying especially if you are impatient like me, however, a phone call can be much more appropriate which can take up to 2 minutes to be answered. If you are looking to host a personal or a small business website, then eHost is a right choice for you. They’ll deliver excellent services to you. Though you may require a dedicated server for an online store, you can still install online store software suites like Magenta, ZenCart, CubeCart, or OsCommerce and get your online store up and running without buying bundled package from other hosts like Yahoo stores or Shopify. Ever since I purchased my hosting account with eHost, I haven’t got into any trouble. Each time I need technical support, I just reach to a chat and have technical team fix the issue. Too many up-sells is the annoying thing I find with them especially when you are just buying for the first time. I remember looking at my total amount on check out, and I was wondering where this all had come from. Only to realize, add-on upsells where checked by default. So, its important to be careful when buying a hosting account with eHost. Double checking your totals before check out is a nice idea, even though they can refund you back extra fee those upsell add-ons. Nevertheless, I’m currently one of their happy customers, hosting my 3 websites with them (including this), I find them much more affordable compared to other hosting companies. Its easy to install and setup a WordPress site with their Quick Install, not only for WordPress but also other popular CMS’s. They also help in moving/transferring your website from another host to their host. I personally find eHost a great hosting company. Until I find any serious bad side about them (which I will not hesitate to write about), I will continue recommending them as the best hosting so far. To try eHost for yourself, click this link to create an account with eHost and claim your 50% discount. Remember, you can always cancel your account and get your money back without questions within 45 days, in case you do not like or not satisfied with their services. So, there is no risk in trying them out. If you have any experience with eHost that you would like to share, please leave it in the comment box below. I will be glad to read about your experience with them. For any comments and questions, don’t hesitate to leave them below and I will be more than glad to read and respond to you. 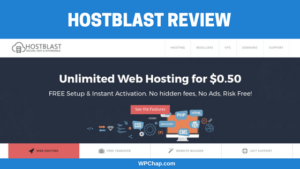 HostBlast Review: What really happens after you sign up? Man thanks for the update I was so ignorant about hosting and domains but now I am grasping it all at least. Fantastical material. Just what I ended up being trying to search for! Well, hasn’t been a bed of roses for me. There was some initial downtime, a 24 hour period in the first week. Now the embedded html (in the SiteBuilder site) stopped working for 5 days running so far. Still not up. Makes me wonder about their IT staff.. This doesn’t sound like a big issue, but it means the paypal buttons aren’t working and can’t make a sale until they fix it. Support just said they are working on it and everyone’s in the same boat. As a result I’m planning to move my site to the cPanel account which hasn’t had any problems so far – am working on a wordpress version of the site as of now (I’m a fast learner). There’s always going to be a downside to the cheapest host and I think I’ve found it. But I will never trust their site builder server again, good thing WordPress is easy to learn. Thanks for the reply GK. I haven’t used their site builder anyways, and for the time I have hosted with their cPanel, I haven’t had significant downtimes. I’m using WordPresss too and haven’t found problems, in fact I got some help from them when I was migrating my WordPress webite to their servers. I have been ripped by EHost by £71.46, they were offering service for £4.99 with 45 days money back guarantee. Its been 26 days, numerous calls and emails and no refund. It is obviously scam!!! Fortunately i paid through paypal and paypal promised to refund me money and remove them completely from paypal as they never replied to paypals emails!!! More over they even managed to setup recurring payment on my paypal account for £148!!! If i didnt notice it they would have taken it too. SCAM!! SCAM!! PLEASE AVOID!!! It’s sad to know that you were almost ripped off your money. Thanks to PayPal. I’ve personally asked for a refund from eHost (this was intentionally to see if they really fulfill their Money-Back-Guarantee claim). To make it riskier on my side, I’d used my Visa credit card to purchase my hosting unlike PayPal, it wouldn’t have been any where close to get a refund. I don’t remember quite well, but it took me about 3 weeks to get my full refund from eHost. I’m not saying they don’t rip off people, but though it took long (about 3 weeks), I still got my refund. Thanks for sharing your experience Galina – really helpful for anyone looking to purchase hosting from them. I purchased the service of eHost internet services. In their site and during the time they offer you to purchase it is offered ….. directly from their site…… 45 Day Money Back If you feel eHost isn’t for you within 45 days we’ll give you your money back, no questions asked. ——- purchase was done on 23/05/2016 and on 23/05/2016 I identified that the services do not appear to be what was promised at the sign up. So I requested cancellation and a full refund of fees. There are only robotic email responses, when I call nobody answers, and their chat service is just to say “we are going to evaluate the request and get back to you”….. I have now been promised a refund minus $15 domain registration which was offered free. They have signposted me to a lengthy “trade agreement” document that I have supposedly signed up to. HOW MANY PEOPLE WILL READ TERMS OF CONTRACT? Poor business practice and short sighted. Thanks for sharing your story Mas. I agree with you, 1 out of 10 people will read the Terms of Contract (I personally skim them most a times). And it is tricky how you have to leave the $15 fee for the domain registration makes one feel like they’re not fully refunded. hie mr.emunot i just need to know as u mentioned in post we have to go 25$ to google to get credits.what i have to do to get 100$free credits as e host offered can you give me an detailed explanation please?